UPDATE: Cruise & Maritime Voyages announced today (Wednesday) that Marco Polo is heading for dry dock in Antwerp for a thorough inspection to ascertain what damage was caused by the grounding off Sortland. Company statement reads: Marco Polo will be terminating her current Land of the Northern Lights cruise in Antwerp on Thursday 14 March on the scheduled arrival day. The ship will undergo a dry docking inspection for minor repairs to her hull after the vessel struck an uncharted object under the command of the local pilot minutes after sailing from Sortland on Saturday evening. CMV have prioritised the comfort and safety of all the passengers and crew. All passengers will be transferred to Tilbury and London via the Channel Tunnel or ferry by coach scheduled to arrive mid to late afternoon on Thursday 14 March. The cruise departures 14 March and 28 March will now depart 3 days later and those passengers affected are being advised. CMV would like to apologies for any inconvenience. All passengers involved in these unavoidable delays and date changes will be receiving compensation, plus special discounts for a future cruise. 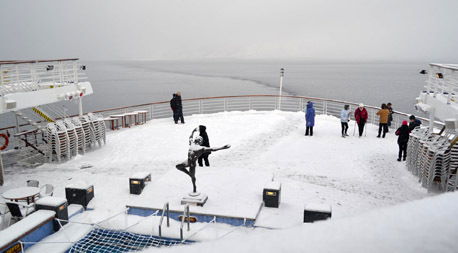 Passengers on CMV’s Marco Polo, who have been enjoying a cruise in the snows of northern Norway, had an unexpectedly extended stay in the remote port of Sortland yesterday, after the ship touched the seabed. In similar circumstances to an incident last weekend, when Hurtigruten’s Kong Harald hit a rock at the entrance to nearby Trollfjord, damage was limited to a small gash in the hull, breaching a ballast tank. Marco Polo is better able than most ships to withstand close encounters of the underwater kind – built as the Aleksandr Pushkin in 1966 for the Russian navy, the ship has an extremely strong ice-strengthened hull. The ship had a local Norwegian pilot on the bridge when it touched bottom shortly after leaving Sortland on Saturday evening. It immediately returned to port for an inspection and minor repairs were carried out before it sailed again on Sunday evening. No injuries were reported among the 1,100 passengers and crew on board. Harbour master Hugo Naess said the cause of the grounding is a mystery. Charts show an adequate depth of water for Marco Polo’s 8.17m (26.8 ft) draft. The ship is returning from a 14-night cruise in search of the Northern Lights and is due back in Tilbury on Thursday (March 15) when it should be setting out on an identical itinerary. It is understood that the delay in Sortland means it will miss a scheduled visit to Andalsnes and instead head directly to Bergen. My mum was due to go on the Marco Polo on Thursday 14th March 2013. She was informed by telephone at around 7pm on tuesday 12th March, that the ship was going into dry dock and her holiday had been rebooked for sunday 17th March. then today Friday 15th March she was told that the holiday had been cancelled, as the damage to the ship was bigger than expected, she was told that she would get a full refund,plus an extra £50.00 for compensation, I think it’s an insult, a company this big to only offer £50.00 compansation. I too think that the £50 is an insult, and I hope that passengers get together and decide to challenge this through legal process if necessary. It would be interesting to hear Captain Greybeards view on this if he thinks there is a case to answer. Also be interested to hear his view of what is going on at Cruise and Maritime, and if they will survive the year, in the last two weeks both their ships have had serious problems, one prevented from sailing by the authorities, I understand because of safety concerns. I agree £50 is not good enough when I read on cruise miss that as quoted “the compensation is yummy” for those who were on the stricken cruise ship! There are lots of questions to be answered! I too agree that, after all the costs relating to the lead up to this cruise, the expectation and disappointment, the way it was first delayed by 3 days then cancelled completly, £50 is a pittance. Ok, thankfully no one was hurt during this unfortunate episode and hopefully the ship will be as good as ever after her repair, there is this downside that, after 15 months of waiting, and we booked in November 2011, it is worth much more. I for one, along with my wife, will have to seriously consider whether we would want to sail again with CMV if that is all they think their followers are worth. Come on Mary. We know it wasn’t the Captains fault and these things do happen but you have obviously been offered a fair compensation package but have also had your cruise. We didn’t! and the compensation offer of £50 just doesn’t go nowhere near the additional outlay for this holiday. We now sit at home waiting for refund so we can book something else. Would the people who commented on there yummy compensation like to tell us what you was offered so we could compare it to our £50 insult please. Yes it would be good to know the compensation the passengers were offered and accepted on the stricken ship. I am sure you had a wonderful trip, Mary and saw the northern lights to boot! We are all very disappointed and were looking forward to a holiday of a lifetime and have not been offered any alternative. We don’t blame the Captain – accidents happen but we must be compensated properly and fairly. We are not moaning but stating facts and £50.00 is all we have been offered! I made a couple of objcetive commenst on the Cruise and Maritime Facebook page regading compensation, and suggesting that passengers who like myself felt that the compensation package was not appropriate, in the first instance take this up with a formal letter to the company then if this is not successful pursue it through the small claims court in respect of costs for items in preparation for the cruise and compensation for the upset and distress the late cancellation has caused, but my Facebook entries seem to have been deleted. It would appear that C&M only want positive items on their page. That way when you and I, who are not happy with what they have done, think that we are the only ones. C&M know that passengers who do not know each other cannot communicate with each other to compare notes and offers, unless there is an independent forum like this. We, too, were on the ‘stricken’ MV Marco Polo – 28th Feb until 14th March 2013. The main issue for us was, lack of, and conflicting information given by both the Captain, and the ship’s guest service manager, Rhys Davies. The ship had left the Sortland port at 7pm and sailed for 2hours before the announcement was given at 9pm, that we were returning to the port as we had hit an uncharted object and sustained damage. We didnt know we were already nearly back at the port when the announcement was given so did panic a bit!! We were just eating our dinner and could only see the sea out of the window so were very anxious about a 2 hr trip back with a hole in the bow. Another diner went to see what was happening and returned with the news that the lower decks and lift were roped off. We felt the company was only interested in their own interests and not the passengers. After emergency repairs were carried we were told we would miss next port and go on to Bergen. Later on they told us we were going to Stavanger where we would be flown home. We waited at sea for a day and half, out side the port, only to be told the dry dock wasn’t big enough for the draft of the ship, which seemed incredible for them to take so long to find that out, when we could find the info on a mobile phone. Some time later, we informed that we were going to the port of Antwerp, where we would return to the UK via a eurotunnel train. As a result of all the delays and inconvenience, we spent 5 days at sea with not a lot to do which is another story. We managed to book flights to Norway and fortunately join another ship for a cruise to see the Northern Lights – which we amazingly saw on several occasions. However, the flights at such short notice cost us a lot and the cruis was much hsorter – £50 a head goes no way to reimburse our additional expense! Why weren’t we offered cabins on the Discovery? Furthermore, we have just received a letter from Cruise and Maritime, giving us a cheque for our train expenses,but, have refused to refund our taxes paid in Norway (original receipts supplied) and they say in their letter that this payment is “made in full and final settlement” arising from the cruise. My question is, what has happened to our compensation they promised us in a letter before we disembarked in Antwerp??? We were on the Marco Polo when the ship hit the seabed,we were very satisfied with the updates given by the captain Bering in mind he was letting the passengers know what was happening as and when he had something to tell us. We recieved said refund 7days after getting home in full. We did book the trip through ROL whom acted very promptly on our behalf. We are the 3rd group of ‘casualties’ in this cruise drama. We were booked on the Marco Polo cruise leaving Tilbury on 14 March. We flew from South Africa to join the cruise. On arrival at Tilbury we were told that the cruise had been delayed by 3 days. We then had to change our holiday plans we had in place after the cruise. A day later we were told that the cruise was cancelled and that we could be refunded or join a Fred Olsen cruise at Alesund in Norway the next day. We chose the latter as we couldn’t waste the expense to travel to and from the UK. We were each given £50 credited to our Boudicca onboard account although we were originally offered £200 onboard credit on the delayed Marco Polo cruise. The Fred Olsen cruise had 6 days at sea and 6 destinations less than the Marco Polo cruise. We were promised compensation for the 3 days we missed out at the beginning of the cruise as well as compensation for fruitless travel to Tilbury and a lost B&B deposit. We got the Norovirus as an added extra but were not advised that the virus was rife on the Boudicca. As a result one of us missed out on a Northern Lights excursion. We think the compensation offered is inadequate for the complications which arose from the delayed and then cancelled Marco Polo cruise as well as the reduced number of destinations. It is quite clear that the way Cruise and Maritime have managed this cancellation and the level of compensation that they are offering is creating a lot of negative comments towards Cruise and Maritime. The level of compensation offered to those who had this cruise cancelled is totally in appropriate, given the additional expense and the disappointment of passengers. I think those passenger not happy with the compensation package should write to Cruise and Maritime in the first instance. If still not happy then they have the opportunity to use the legal system and take Cruise and Maritime to the Small Claims Court to apply for appropriate compensation. That way a District Judge will decide if Cruise and Maritime have managed this in a professional manner, or their approach towards managing passengers is below what would be expected for a commercial cruise company, and decided on an appropriate level of compensation. Passenger may want to consider using the the circumstances of the cancellation/delay of the companys other cruise on the Discovery weeks earlier as evidence that this is not an isolated incident. In defence of C&M slightly I think the compensation is being misquoted here. As I understood it it was a full refund, £50 per person compensation and a 25% discount of your next cruise with them. 25% is a lot of money saved possibly – As it was out of C&Ms hands I thought this was fair. I was on the stricken Discovery when it was detained by the Maritime and Coastguard Agency. Our compensation was £250 per person. This no way compensates for a 16 day trip of a lifetime. About £16 per day!!!. I am a Trading standards professional and my claim will be in excess of £5,000 after the refund was paid. Ensure you do not bank cheques as full and final payment but on an interim basis. You will need to write to them to agree this. there are many heads of claim. To all those of your who Have received your ‘compensation’ from M&C… consider yourselves fortunate. We, on the other hand, are still waiting for ours!!!! Hi, all of those passengers who have received their compensation from M&C, should consider themselves fortunate. We, on the other hand, are still waiting to receice ours. We were booked on the 14th March Marco Polo Northern Lights departure that was cancelled due to the hull being damaged when sailing out of Sortland. We were given £50 a person cash compensation and told we were entitled to 25% off a future cruise with Cruise & Maritime if booked before 30th June 2013. We tried to use the 25% compensation discount this morning and discovered that Cruise & Maritime say they actually mean 25% off the FULL price of the cruise, not 25% off the current going price they are advertising. This means they are giving us precisely nothing in extra discount for our upset and inconvenience as they almost constantly offer large discounts on their cruises. Their current offer of “Buy 1 get 1 Half Price” (which is in effect 25% off the full price for all comers) means we pay exactly the same as absolutely anyone booking that cruise at the moment. How can this therefore be described as compensation as we are getting ABSOLUTELY NOTHING off the price of the cruise that we could not obtain as a completely new client? I feel the 25% off a future cruise was offered to make us feel we were getting some sort of redress, when actually I expect Cruise & Maritime were well aware that their offer would mean nothing in real financial terms. I feel angry and upset that this is how we have been treated and that their offer of compensation was not what it seemed. Hi All. After writing a letter of complaint to the chief director of C&M, we finally received the taxes we paid in Norway. However, after acknowledging our letter of complaint, he has, conveniently, failed to respond further. A pitiful way of promoting customer relations. I only want to ensure future passengers of the Marco Polo are fully aware of our experience following the incident, and that their ‘promises’ are as fragile as the hull of the cruise ship. The way Cruise and Maritime have treated their customers is disgusting. I always thought that the offer of discount on a future Cruise was a sham. I would urge the customers who had their Cruise cancelled and want to seek compensation is to take Cruise and Maritime to the Small Claims Court, it is fairly easy to do and not that expensive. Otherwise Cruise and Maritime will just continue to have a total disregard for their customers.